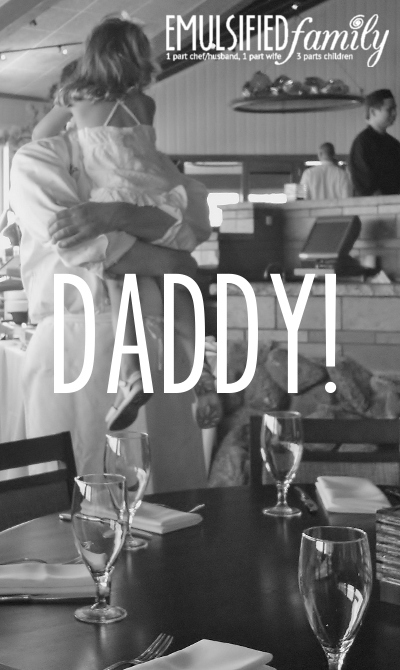 I know you think it’s cute and funny, but every time we head into my chef/husband’s restaurant (well, it’s not actually his, but you know what I mean) we have to have a conversation about not yelling, “Daddy” across the restaurant! Let me set the scene for you in case you’re having trouble picturing it in your head. If you’ve never been there, Palisade is a HUGE restaurant. The first time we pulled up to the front, one of the girls asked if it was a hotel. My husband’s response was, “No. This the restaurant I’m going to start working at next week.” You should have seen the look on their faces – lol! It’s very romantic (when you are there without kids). There’s a great view of the kitchen line as soon as you walk in the door (with a possible glimpse of Daddy). On the way to your table you walk over a bridge to get across the pond (yes, there’s a pond full of fish inside the restaurant). The girls usually ask to feed the fish if we have to wait for our table. There’s a fairly good chance one of them is going to fall in . . . at least it’s not deep. Suddenly there is a glimpse of Daddy across the restaurant. There’s really no doubt we are the chef’s family after we’ve been in the restaurant for a few minutes because of the amount of people that come up to our table. We’re either famous, or related to someone who works there. Then when the chef walks out and hugs and kisses everyone at the table, it’s pretty obvious. I’m pretty sure he doesn’t do that with all the guests. At a more casual restaurant, it might not be as big of a deal. I would still be a bit nervous about behavior, but at least if they called out, it’s not as quiet! So tomorrow night we are headed out to enjoy his cooking. He’s been busy working on a new menu for the casual restaurant located just below Palisade and we’re going to go check it out! So while there is no chance of falling in the fish pond, there’s still the chance of calling out. We’ll see how it goes! 🙂 I’m ready to have the “How do we behave in the restaurant” conversation in the car. Does anyone else dine out with their kids at their chef/spouse’s restaurant (or the one they cook at . . . you know what I mean)? Is it a bit stressful for anyone else?